What springs to mind when you hear that name? Jazz Age Flapper? Imbiber of champagne? World traveler and partier extraordinaire? Famous novelist’s wife? Mental health-challenged? What about painter, poet, dancer, writer and rebel? 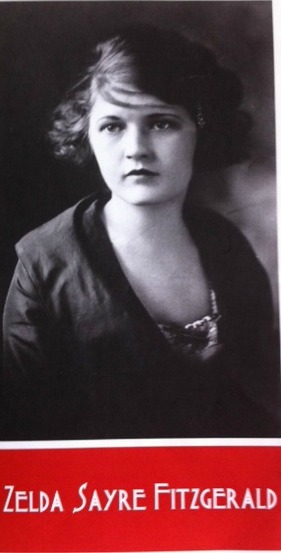 In case you’re wondering, “Well, who the heck is Zelda Sayre Fitzgerald anyway?,” she was the wife of celebrated novelist F. Scott Fitzgerald, but more importantly, a deeply committed creative in her own right. As an English major back in the aughts, I read F. Scott Fitzgerald’s Tender is the Night and The Great Gatsby like most other self-respecting beret-wearing, clove-cigarette-smoking, faux hipsters of the day, but it was Zelda I always had a deep fascination with. I knew she was a creative and did some writing, but until recently, I never knew she painted and danced as well. What brought lovely Zelda to mind for me again recently was a local exhibit at the Cameron Art Museum here in Wilmington. My buddy Carolyn and I decided to have brunch at the museum café for the $5 mimosas (priorities, people), and since there was a current exhibit of Zelda’s paintings up, we lingered and made our way through the gallery after indulging in bacon and booze. Since I was about to begin a new series of creative rebel profiles here on the blog, I thought Zelda was a fitting subject for the very first. The exhibit, called “Sometimes Madness is Wisdom: The Art of Zelda Sayre Fitzgerald,” featured 32 framed artworks created from 1927 through the late 1940s. Interestingly, the title of the show was one she herself gave to an exhibition of her work at the Cary Ross Gallery in New York City in 1934. After the taking in the exhibit I had to know more about Zelda, and the deeper I fell down the research rabbit hole, the more I fell in love with her. As a teenager, Zelda actively flaunted the conventions of the day, drinking, smoking and hanging out with boys. And this was in the early 1920’s, mind you. She also loved and excelled at dance as a young girl, so the creative bug took hold early on. After the success of her husband’s first novel, This Side of Paradise (1920), Zelda and Scott became instant celebrities, partying and drinking their way around the globe and hobnobbing with literary luminaries like Ernest Hemingway, John Dos Passos, Gertrude Stein, and other well-known writers, poets, artists and professional drinkers. According to various sources, their marriage was a “tangle of jealousy, resentment and acrimony.” Scott drank to excess; Zelda also enjoyed the drink, but didn’t slide down the slippery slope of heavy recreational drinking into alcoholism, as her husband did. She kept a diary, which her hubs was inspired enough by to use passages from in his novels This Side of Paradise and The Beautiful and the Damned. She also collaborated with the Mister on several short stories and articles, and wrote a few short stories and articles of her own. While she and Scott were living in Paris in 1925, she began ballet lessons, and became obsessed with the idea of becoming a ballerina, training for up to 8 hours a day. Around 1932, while being treated at the Phipps Psychiatric Clinic in Baltimore, she wrote an autobiographical novel, Save Me the Waltz, in which she spilled the beans about her marriage to Scott, her obsession with ballet, and her nervous breakdowns. In 1934, she began painting, working in oils, pastels, and watercolors, using dancers as a recurring theme. This idea of needing multiple creative outlets is something I’ve noticed about many creatives I’ve known over the years – one creative outlet usually isn’t enough. Writers paint, painters write, dancers are poets, poets are playwrights. And so on. And think about this for a minute – Zelda’s need to create was so powerful that she wrote a novel while in a psychiatric clinic. Sure, maybe there’s a lot of uninterrupted down time to write in that situation, something every writer I know fervently craves, but she was being treated for mental illness. A wee distraction if you ask me. In 1936, she entered the Highland Mental Hospital in Asheville, North Carolina where she painted extensively and worked on a second novel. Tragically, she died in a fire at the hospital in 1948. Her husband had descended ever deeper into alcoholism, dying in 1940 of a heart attack. I cannot tell a lie: I find Zelda wildly inspiring. Because despite globe-trotting across New York, Paris, Alabama and other locales the whole of her life (she’s lived in more places than even I have, and that’s saying something), mental health challenges and hospital stays, and a tumultuous marriage to an alcoholic and fellow creative, Zelda never stopped expressing her creativity. I’ll leave you with one of my favorite Zelda quotes (and believe me, it was hard to choose) . . .
What about you? What painter, poet, artist or writer from the past has mesmerized and inspired you, and why? Let me know in the comments!